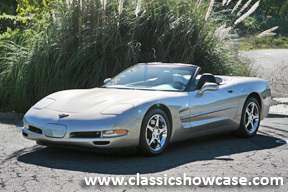 This incredible, one-owner Corvette has always been maintained and only serviced through the Chevrolet dealer. The vehicle was special ordered in 2001 to the owner’s specifications, and has been lightly driven over the past 10 years, giving the vehicle a little over 15,000 original miles. It is completely original, and comes with all service records, books and tools. It features power windows, locks, seats (both passenger and driver) along with a vehicle alarm. It features Zone A/C, Climate Control, and the original factory AM/FM CD player in dash with factory BOSE speakers. The owner had custom floor mats made for the vehicle that display the Corvette emblem and has chromed the original stock wheels. In the early ‘50s, it was only a designer’s dream. Today the Corvette stands alone as America’s dream car – a testament to its unmistakable charisma and the excitement it inspires. Unique styling, powerful performance and an undeniable panache have made Corvette one of the most celebrated sports cars in the world.